منتظری, محمد, فتحی زاده, علیرضا, صادقی, جواد. (1396). تاثیرات اعتماد به‌ مدیر بر رفتار شهروندی سازمانی و عملکرد سازمانی. مطالعات رفتار سازمانی, 6(4), 81-105. محمد منتظری; علیرضا فتحی زاده; جواد صادقی. "تاثیرات اعتماد به‌ مدیر بر رفتار شهروندی سازمانی و عملکرد سازمانی". مطالعات رفتار سازمانی, 6, 4, 1396, 81-105. منتظری, محمد, فتحی زاده, علیرضا, صادقی, جواد. (1396). 'تاثیرات اعتماد به‌ مدیر بر رفتار شهروندی سازمانی و عملکرد سازمانی', مطالعات رفتار سازمانی, 6(4), pp. 81-105. منتظری, محمد, فتحی زاده, علیرضا, صادقی, جواد. تاثیرات اعتماد به‌ مدیر بر رفتار شهروندی سازمانی و عملکرد سازمانی. مطالعات رفتار سازمانی, 1396; 6(4): 81-105. 1استادیار، گروه مدیریت، دانشگاه پیام نور، تهران، ایران. 2مربی، گروه مدیریت، دانشگاه پیام نور، تهران، ایران. هدف پژوهش حاضر، بررسی تأثیرات اعتمادبه­مدیر بر رفتار شهروندی سازمانی و عملکرد سازمانی در ادارات دولتی شهر سیرجان است. این تحقیق از حیث جهت­گیری، تحقیقی کاربردی و ازنظر رویکرد کلی، تحقیقی قیاسی است. همچنین ازلحاظ راهبرد پژوهش، تحقیقی توصیفی پیمایشی بوده و ازنظر افق زمانی، پژوهشی تک‌مقطعی به‌شمار می­آید. برهمین‌اساس در قالب یک پیمایش و با استفاده از روش نمونه­گیری طبقه­ای تصادفی 341 نفر از کارکنان ادارات دولتی شهر سیرجان به‌عنوان نمونه انتخاب شدند. برای گردآوری داده­ها، از سه پرسشنامۀ: اعتمادبه­مدیر مک آلیستر(1995)، رفتار شهروندی لی و آلن(2002) و عملکرد سازمانی کریکمن و روزان (1999) استفاده شد. پایایی پرسشنامه­های فوق براساس ضریب آلفای کرونباخ به‌ترتیب91/0، 82/0 و 88/0 و پایایی ترکیبی به‌ترتیب 93/0، 85/0 و 95/0تأیید شد و برای تعیین روایی نیز از تحلیل عاملی تأییدی، روایی همگرا و روایی واگرا استفاده گردید. برای آزمون فرضیه‌ها از مدل‌سازی معادلات ساختاری در نرم‌افزار Amos Graphics بهره گرفته شد. نتایج نشان داد که رفتار شهروندی سازمانی در رابطه میان اعتمادبه­مدیر (اعتماد عاطفه­محور و اعتماد شناخت­محور) و عملکرد سازمانی نقش میانجی دارد. براین‌اساس، مدیران ادارات دولتی باید با تلاش درجهت ارتقای حس اعتماد کارکنان به مدیر، موجبات افزایش رفتارهای شهروندی در آنان را فراهم کرده و از مسیر این رفتارها، عملکرد سازمانی را بهبود ببخشند. داوری، علی و رضازاده، آرش (1392)، مدل‌سازی معادلات ساختاری با نرم­افزار PLS، تهران: انتشارات جهاد دانشگاهی، چاپ اول. 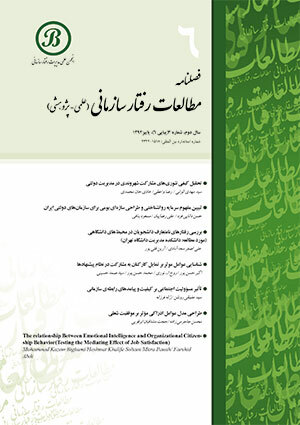 دهنوی، فریبا و احمدی، سیدعلی اکبر (1392)، تبیین مولفه­ها و سنجش اعتماد بین فردی (مورد مطالعه: سازمان تامین اجتماعی)، فصلنامه مطالعات رفتار سازمانی، سال دوم، شماره سوم (پیاپی ششم): 1-24. زارعی متین، حسن؛ جندقی، غلامرضا و توره، ناصر (1385)، شناخت عوامل رفتار شهروندی سازمانی و بررسی ارتباط آن با عملکرد سازمانی، فصلنامه فرهنگ مدیریت، سال چهارم، شماره دوازدهم: 31-63. شیرازی، علی؛ خداوردیان، الهام و نعیمی، محمد (1391)، تأثیر اعتماد سازمانی در بروز رفتارهای شهروندی سازمانی(مورد مطالعه: شرکت گاز استان خراسان شمالی)، پژوهش­نامه مدیریت تحول، سال چهارم، شماره هفتم: 133-154. قاسمی، حمیدرضا؛ جهانگیری موموندی، بابک و علی میری، مصطفی (1392)، بررسی تأثیر تعلق خاطر بر رفتار شهروندی کارکنان، فصلنامه مطالعات رفتار سازمانی، سال دوم، شماره سوم(پیاپی ششم): 25-42. مردانی، محمدرضا؛ طوطیان اصفهانی، صدیقه و بوشهریان، حسینعلی (1396)، شناسایی و رتبه‌بندی عوامل مؤثر بر اعتمادسازی بین کارکنان و مدیران، فصلنامه مطالعات رفتار سازمانی، سال ششم، شماره اول(پیاپی بیست و یکم): 177-199. مصلح، عبدالمجید؛ الهیاری بوزنجانی، احمد و جعفرپور، یونس (1394)، رفتارهای شهروندی خدمت­گرا: اثر کیفیت ادراک شده کارکنان از خدمات درونی، فصلنامه مطالعات رفتار سازمانی، سال چهارم، شماره دوم(پیاپی سیزدهم): 143-163. منتخب یگانه، محمد؛ بلشیده، کیومرث و بهارلو، مصطفی (1393)، بررسی اثر رهبری خدمتگزار بر رفتار شهروندی سازمانی: نقش واسطه‌ای توانمندسازی روانشناختی، عدالت سازمانی و خشنودی شغلی، فصلنامه مطالعات رفتار سازمانی، سال سوم، شماره چهارم (پیاپی یازدهم): 63-87. Ahmed, M. M. & Filadelfo, L. (2016). Public Service Motivation and Organizational Performance in Mexico: Testing the Mediating Effects of Organizational Citizenship Behaviors. International Journal of Public Administration, 39, 40–48. Brewer, G. A. & Selden, S. C. (2000). Why elephants gallop: Assessing and predicting organizational performance in federal agencies. Journal of Public Administration Research and Theory, 10(4), 685–712. Brockner, J., Siegal, P. A., Daly, J. P., Tyler, T. & Martin, C. (1997). When trust matters: The moderating effect of outcome favorability. Administrative Science Quarterly, 42, 558-583. Chan, S. H. & Lai, H. Y. (2017). Understanding the link between communication satisfaction, perceived justice and organizational citizenship behavior. Journal of Business Research, 70, 214–223. Choi, N. H., Dixon, A. L. & Jung, J. M. (2005). Dysfunctional behavior among sales representatives: The effect of supervisory trust, participation, and information controls. Journal of Personal Selling and Sales Management, 24, 181-198. Davis, J. H., Schoorman, F. D., Mayer, R. C. & Tan, H. H. (2000). The trusted general manager and business unit performance: Empirical evidence of a competitive advantage. Strategic Management Journal, 21, 562-576. Dirks, K. T. (2000). Trust in leadership and team performance: Evidence from NCAA basketball. Journal of Applied Psychology, 85, 1004-1012. Dirks, K.T. & Ferrin, D. L. (2002). Trust in leadership: meta-analytic findings and implications for research and practice. Journal of Applied Psychology, 87(4), 611-628. Eatough, E. M., Chang, C., Miloslavic, S. A. & Johnson, R. E. (2011). Relationships of role stressors with organizational citizenship behavior: A meta-analysis. Journal of Applied Psychology, 96(3), 619–632. Erdam, F. & Ozen, J. (2003). The relationship between trust and team performance. International Journal of Productivity and Performance Management, (7), 337-340. Flaherty, K. E. & Pappas, J. M. (2000). The role of trust in salesperson-sales manager relationships. Journal of Personal Selling & Sales Management, 20, Fall, 271-278. Fornell, C. & Larcker, D. F. (1981). Evaluating structural equation models with unobservable variables and measurement error. Journal of marketing research, 39-50. Gibson, D. & Petrosko, J. (2014). Trust in leader and its effect on job satisfaction and intent to leave in a healthcare setting. New Horizons in Adult Education & Human Resource Development, 26(3), 3-19. Gkorezis, P. & Bellou, V. (2016). The relationship between leader self-deprecating humor and perceived effectiveness Trust in leader as a mediator. Leadership & Organization Development Journal, 37(7), 882-898. Harris, R. B. & Harris, K. J. (2007). A Test of competing models of the relationships among perceptions of organizational politics, perceived organizational support, and individual outcomes. The Journal of Social Psychology, 147, 631-655. Hui, C., Lee, C. & Rousseau, D. M. (2004). Psychological contract and organizational citizenship behavior in China: Investigating generalizability and instrumentality. Journal of Applied Psychology, 89(2), 311–321. Hui, W. M. & Li, L. R. (2008). Effects of trust in leader on organizational citizenship behavior and team performance: empirical evidence from China. International Conference on Management Science & Engineering, (15), 907-912. Kim, S. (2005). Individual-level factors and organizational performance in government organizations. Journal of Public Administration Research and Theory, 15(2), 245–261. Kirkman, B. L. & Rosen, B. (1999). Beyond self-management: antecedents and consequences of team empowerment. Academy of Management Journal,1, 58-74. Konovsky, M. A. & Pugh, S. D. (1994). Citizenship behavior and social exchange. Academy of Management Journal, 37, June, 656-669. Lee, K. & Allen, N. J. (2002). Organizational citizenship behavior and workplace deviance: the role of affect and cognition. Journal of Applied Psychology,87, 131-142. Lin, C. & Peng, T. (2010). From organizational citizenship behavior to team performance: the mediation of group cohesion and collective efficacy. Management and Organization Review, 6(1), 55–75. MacKenzie, S. B., Podsakoff, P. M. & Rich, G. (2001). Transformational and transactional leadership and salesperson performance. Journal of the Academy of Marketing Science, 29, Spring, 115-134. Mayer, R. C. & Gavin, M. B. (2005). Trust in management and performance: Who minds the shop while the employees watch the boss?. Academy of Management Journal, 48(5), 874-888. Mayer, R. C., Davis, J. H. & Schoorman, F. D. (1995). An integrative model of organizational trust. Academy of Management Review, 20(3), 709-734. McAllister, D. J. (1995). Affect and cognition-based trust as foundations for international cooperation in organizations. Academy of Management Journal, 38(1), 24-59. Messersmith, J. G., Patel, P. C., Lepak, D. P. & Gould-Williams, J. S. (2011). Unlocking the black box: exploring the link between high performance work systems and performance. Journal of Applied Psychology, 96(6), 1105–1118. Moorman, R. H., Darnold, T. C. & Priesemuth, M. (2013). Perceived leader integrity: supporting the construct validity and utility of a multi-dimensional measure in two samples. The Leadership Quarterly, 24(3), 427-444. Podsakoff, P. M. & MacKenzie, S. B. (1997). Impact of organizational citizenship behavior on performance: A review and suggestions for further research. Human Performance, 10(2), 133–151. Podsakoff, P., MacKenzie, S. B., Moorman, R. H. & Fetter, R. (1990). Transformational leader behaviors and their effects on followers’ trust in leader, satisfaction and organizational citizenship behaviors. Leadership Quarterly, 1(2), 107-142. Podsakoff, P. M., Mackenzie, S. B., Paine, J. B. & Bachrach, D. G. (2000). Organizational citizenship behaviors: a critical review of the theoretical and empirical literatures and suggestions for future research. Journal of Management, 26, 513-553. Pooja, A. A., Clercq, D. A. & Belausteguigoitia, I. (2016). Job Stressors and Organizational Citizenship Behavior: The Roles of Organizational Commitment and Social Interaction. Human Resource Development Quarterly, 2016, 1-33. Riaz, S. (2015). High performance work systems and organizational Performance: an empirical study on manufacturing and service organizations in Pakistan. Public organization Review, June, 1-22. Richard, P., Devinney, T., Yip, G. & Johnson, G. (2009). Measuring organizational performance: towards methodological best practice. Journal of Management, 35, 804-817. Schwepker, H. C. & Schultz, J. R. (2013). The impact of trust in manager on unethical intention and customer-oriented selling. Journal of Business & Industrial Marketing, 28(4), 347–356. Sheppard, B. H. & Sherman, D. M. (1998). The grammars of trust: a model and general implications. Academy of Management Review, 23, July, 422-437. Sjahruddin, H., Achmed, A. & Normijati, S. (2013). Organizational Justice, Organizational Commitment and Trust in Manager as predictor of Organizational Citizenship Behavior. Interdisciplinary Journal of Contemporary Research in Business, 4(12), 133-141. Smith, C. A., Organ, D. W. & Near, J. P. (1983). Organizational citizenship behavior: Its nature and antecedents. Journal of Applied Psychology, 68(4), 653–663. Taylor, J. (2013). Goal setting in the Australian public service: Effects on psychological empowerment and organizational citizenship behavior. Public Administration Review, 73(3), 453–464. Ucanok, B. & Karabati, S. (2013). The effects of values, work centrality, and organizational commitment on organizational citizenship behaviors: Evidence from Turkish SMEs. Human Resource Development Quarterly, 24,89-129. Williams, L. J. & Anderson, S. E. (1991). Job satisfaction and organizational commitment as predictors of organizational citizenship and in-role behaviors. Journal of Management, 17(3), 601–617.